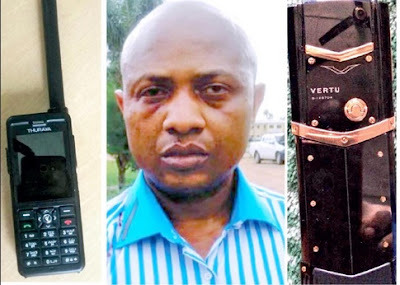 162 phones lines have been recovered from suspected billionaire kidnapper, Chukwudumeme Onwuamadike, popularly known as Evans. A senior police officer who spoke on the condition of anonymity, said: “More discoveries have been made during investigation. On Wednesday, we discovered that Evans still had 36 more SIM cards outside the 126 lines we already have. He has 11 phones, including a Thuraya and 2 Vertu phones, valued at N2.4 million and N2.6 million, respectively. That was why it was very difficult to arrest him because the two phones can operate without SIM cards. That is the kind of phone the Boko Haram terrorist group is using in the desert. All the 162 lines are operational lines, except one that is for his immediate family. We are working on the new lines and phones. A detective stated that a number of SIM cards used by Evans complicated the challenges posed by the sophisticated phones, adding that he bought the SIM cards registered from miscreants in Computer Village, Ikeja. He said, “We studied and analysed 162 SIM cards before we caught him. We have about two-page analysis of each of the numbers. He used 161 of those numbers to call his gang members only and used one to call his mother, wife and sister. He said he bought all the SIM cards already registered in Computer Village for N1,500 each. We picked his sister, his childhood friend with whom he attended primary school, and four of his girlfriends. Another source confided that aside from a camp in New Igando, where Evans kept his victims, operatives had uncovered two other camps, which would soon be visited.